Millions of tons of plastic waste pollute our world. If we can turn them into fuel? This is a very worthwhile discussion topic! In the past, this was an impossible goal, but now DoingGroup has developed a waste plastic pyrolysis plant, which is a closed and oxygen-free environment. Waste plastics are heated at a high temperature to obtain fuel, carbon black, and flammable gases after the cracking reaction. After this reaction, the fuel rate is 45-50%, the carbon black rate is 30%, and the combustible gas yield is 10%. This shows that it is technically feasible to convert waste plastics back into oil! How can you turn plastic back into oil through the DoingGroup's waste plastic pyrolysis plant? 1. Pass the waste plastic through the automatic pushing device and send it to the reaction vessel. 2. The reactor is heated and the temperature reaches a certain level. The waste plastic begins to crack out of the oil and gas. 3. The cracked oil and gas enters the condensing system under the action of high and low pressure, and is liquefied into heavy oil and falls into the oil tank. 4. The waste flue gas and waste water produced during the combustion process are treated to achieve zero pollution to the environment. All kinds of emissions strictly comply with European and American environmental assessment standards. 5. The waste generated during the combustion process is automatically discharged from the furnace through the side slag discharge system. 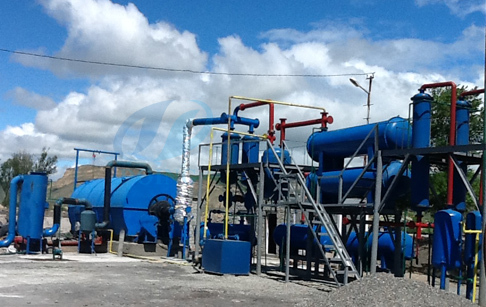 The company's waste plastics pyrolysis plant, whether it is cooling water or dust water, uses recycled water to ensure zero discharge of waste water in the production process. 1) Cooling water, vertical condenser design, oil running inside the pipe, and water running outside the pipe. Zero contact with water and oil, cooling water can be recycled without emissions. 2) Dust out water, adopt professional water film dust collector. 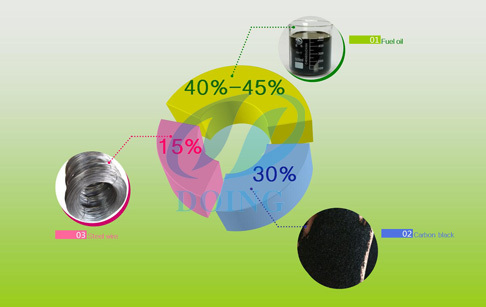 The three-layer high-pressure spray technology, can ensure that the solid small particles in the smoke are fully washed; the recycling of dust can be realized. 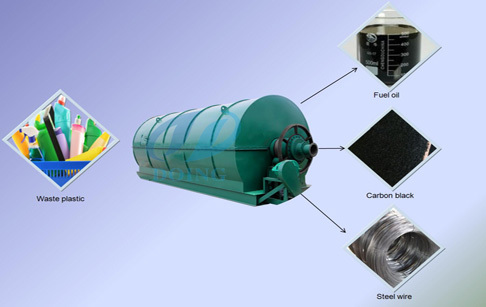 If the fuel is coal, firewood or heavy oil, the amount of smoke is large, you can also choose to use pulse type dust collector. The pulse dust collector is a dry dust collector and does not require water, so there is no moisture emission. The main source of waste gas and the tail gas produced during the production of oil refining, in addition to some of the non-condensable gases that can be directly used to heat the reactor, there is also a small amount of contaminating gases. In response to these small amounts of contaminating gases, DoingGroup launched a desulfurization and odor removal tower system, which is specially used to remove H2S gas, and some NOx, COx, helping customers thoroughly solve the problem of difficult to achieve environmental impact assessment. Customers have been well received. It is concluded that convert of waste plastic into oil is also feasible in handling relevant environmental assessment procedures!!! At present, the technology for converting waste plastics into fuel has matured.And as the last explaination,the technolygy and relevant environmental assessment is feasible!!! 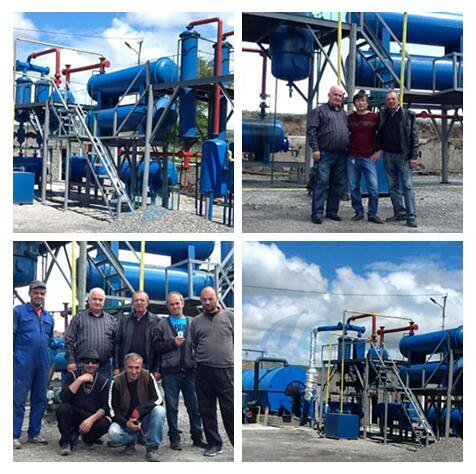 Last month a customer from Georgia finished the distillation of the waste plastic pyrolysis plant in his country under our enginner's guidence!! If you wanna to get more details about Plastic pyrolysis plant project report you can send E-mail to market@doinggroup.com. You can consult our professional engineer and specialized sales team with leave a message in below form.We will contact with you ASAP.You also can visit our factory in Henan,China.Get Detailed address.